STRASBOURG • Security forces searched through eastern France yesterday for a man suspected of killing two people in an attack on a Christmas market in Strasbourg and who was known to have been religiously radicalised while in jail. French and German agents checked vehicles and trams crossing the Europa Bridge on the Rhine river, along which the Franco-German frontier runs, police said, backing up traffic in both directions. "The hunt continues," Deputy Interior Minister Laurent Nunez said on France Inter radio. Asked whether the suspect might have left France, he said: "That cannot be ruled out." The gunman struck on Tuesday just as the picturesque Christmas market in the historic city was shutting down. He engaged in two brief gunfights with security forces as he evaded a police dragnet and was thought to have been wounded in the exchanges, Mr Nunez said. Two people were killed and a third person was brain-dead and being kept on life support, prosecutor Remy Heitz told a news conference. Six other victims were fighting for their lives. An investigation had been opened into alleged murder with terrorist intent and suspected ties to terrorist networks with intent to commit crimes, Mr Heitz said. No one has yet claimed responsibility, but the US-based Site intelligence group, which monitors militant websites, said supporters of the Islamic State in Iraq and Syria were celebrating. Mr Nunez said the suspect had spent time in prison in France and Germany. "It was during these spells in jail that we detected a radicalisation in his religious practices. But there were never signs he was preparing an attack," he said. 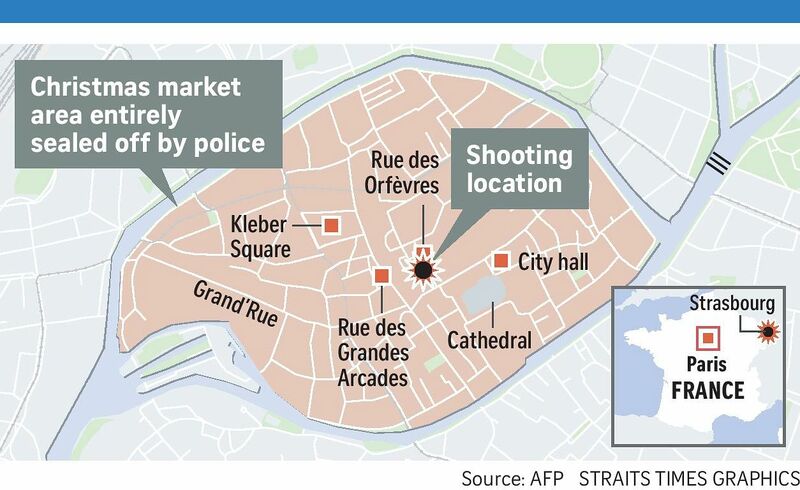 Singapore has condemned the vicious gun attack in Strasbourg, France, on Tuesday that resulted in deaths and a number of people injured. "We extend our deepest condolences to the bereaved families and wish the injured a swift recovery," said a Ministry of Foreign Affairs (MFA) spokesman in a press statement issued yesterday. The ministry added that the Singapore embassy in Paris is in contact with the French authorities and there have been no reports of Singaporean casualties or injuries so far. It also advised Singaporeans in Strasbourg to monitor the news and heed the advice of the local authorities. The ministry also asked Singaporeans to contact their family and friends to let them know they are safe. A spokesman for Germany's BKA criminal police said Chekatt was deported to France last year and was known to French authorities as a radical Islamist. The revelation that Chekatt was on a security watch list will raise questions over possible intelligence failures, though some 26,000 individuals suspected of posing a security risk to France are on the "S File" list. Of these, about 10,000 are believed to have been radicalised, sometimes in fundamentalist Salafist Muslim mosques, in jail or abroad. Police had raided the suspect's home early on Tuesday in connection with a homicide investigation. Five people were detained and under interrogation as part of that investigation. More than 600 security personnel were involved in yesterday's manhunt in France, as well as border agents in Germany. French Justice Minister Nicole Belloubet told Public Senat television there was no need for the government to declare a state of emergency as new legislation gave police adequate powers to handle the situation. Secular France has for years grappled with how to respond to both home-grown and foreign militants following attacks in Paris, Nice, Marseille and beyond. In 2016, a truck ploughed into a Bastille Day crowd in Nice, killing more than 80 people. In November 2015, coordinated Islamist militant attacks on the Bataclan concert hall and other sites in Paris claimed about 130 lives.